Ghosts of the River Road Tour 1: Troy Taylor (American Hauntings Owner) and Lisa Taylor Horton (American Hauntings Manager) host the Ghosts of the Great River Road Tour. 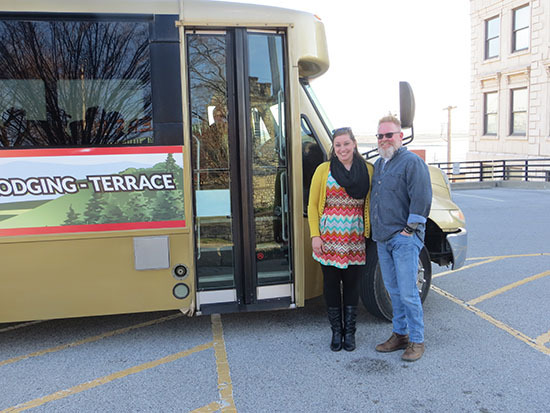 Guests enjoyed a 3-hour bus tour of the river road plus a dinner at Aerie's Winery. 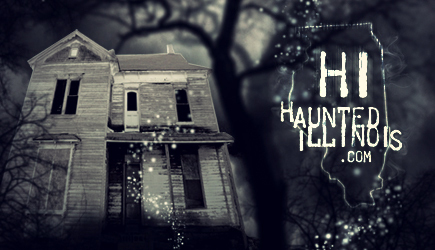 American Hauntings has been a leader in Illinois haunted history tours since 1994. Their Ghosts of the Great River Road tour is another example of how they continue to reinvent the tour experience, offering not only history and ghostly tales, but also a one-of-a-kind tour that one will not soon forget. The tour is hosted by American Hauntings owner, Troy Taylor, and American Hauntings manager, Lisa Taylor Horton. The tour begins in historic Alton where guests board a bus driven by perhaps the most pleasant bus driver you will meet, Sonny. Right off the bat, Taylor begins your ride into the haunted history of the river region. The bus travels down the river road with one side of the bus facing the mighty Mississippi and the other facing the towering bluffs. 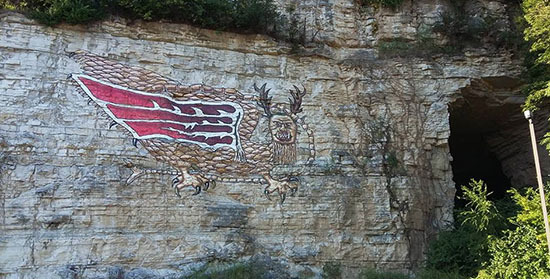 Overlooking the river on one of the many bluffs is the infamous Piasa Bird. The painted representation of the monstrous bird stems from local Illini Indian Legend. In 1637 adventurer Father Jacques Marquette recorded the legend in his writings as he traveled down the Mississippi. The Piasa Bird was believed to have giant horns like a deer, black, red, and green scales, and human facial features. The bird would fly and swoop down, carrying victims to their death. Legend states the Illini formed a plan to kill the bird and after an intense battle and numerous arrows striking the monster, the bird fell into the river and died. While a bird of prey is thought to once stalk the area inhabitants, there is also a site that was known to heal. We pulled off the road to see the resort town of Chautauqua which is listed on the National Register of Historic Places. The settlement was founded in 1885 and was marketed in subsequent years as having healing spring water that could cure all sorts of ailments. Healing powers or not, it adds to the mystery of the river road. The Piasa Bird was a ferocious creature that terrified local Native Americans and created a legend of it's own. A stop through the historic and quaint town of Elsah is worth the next detour. The town's history starts in the 1850s when a man named James Semple offered free lots to anyone who would build their home out of the stone from his quarry. Remnants of the stone buildings still exist and give a glimpse into the past. Considering the age of the town it isn't surprising that history still lingers as well as the tales of ghostly encounters, particularly those that occur in the towns several bed and breakfasts. If you ever want a quiet getaway near the river with a few haunts tossed in, you will want to put Elsah down as a contender. Not everything along the river road was a pleasant page from the history books. We learned of a �Pest House� that was used to contain those who had diseases such as cholera and smallpox. The house was located in an area known as Baby Hollow. Hundreds of people died and were buried in the nearby woods. To this day people swear the ghosts of the diseased still walk Baby Hollow and if you listen you can hear their cries. We ventured on to Grafton where our dinner and drinks awaited. Not all river towns have the charm and presence that Grafton holds. There is something special about this town. It's peaceful, scenic, and has a different air about it. Perhaps it's the bluffs or the wine? Maybe both? And yes, I did mention wine. Our dinner was scheduled at Aerie's Winery on the top of a hill overlooking the river. The meal at Aerie's was delicious and the wine selection plentiful. The dinner was included with the tour with each guest buying their own drinks; the view was free. Speaking of the view, upon looking out over the bluffs it's easy to forget that you're in Illinois. It almost feels like you've entered into a whole new state entirely. For the selfie Queens and Kings out there it is a perfect place to snap a shot of yourself. I can promise that even the most unphotogenic of us can look fantastic against the Aerie's Winery views. After the meal at Aerie's we made our way back to the bus. Our next stop was the historic Ruebel Hotel. Built in 1879 by Michael Ruebel, it was known as the most upscale hotel in Jersey County and even today it still has a special charm. Hosting over 30 rooms and a well-known saloon, the Ruebel became a prime stop for those traveling the river. Hotels seem to be hot spots for paranormal activity and the Ruebel is no different. Guests have reported unexplained noises, shadows, and even the spirit of a young girl named Isabel that roams the hallways. Floods, fires, and time couldn't keep the Ruebel down and it still serves as a hotel and bar where we enjoyed a few drinks and laughs before returning to Alton. Our stomachs were full, thirst quenched, and ears open to the final stories that were told as we headed back to Alton. In 1833 the Alton Penitentiary was opened. It was the first prison in Illinois. Prison is never a place you want to find yourself but you surely wanted to avoid it in the 1800s. Conditions at the prison were deplorable. Rats, bugs, and disease were plentiful with fresh water, food, and medical care scarce. The horrible conditions led to the prison closing in 1860. The buildings sat empty for several years until it was needed once more; this time for housing Confederate soldiers. The maximum capacity of the prison was around 800 however, it is estimated the number of prisoners may have reached nearly 1900. Conditions were even more unsanitary and dangerous than they were when the prison initially closed. Smallpox became an epidemic at the prison, spreading like wildfire with numerous deaths each day. Men who were sick were sent to the nearby Sunflower Island to seclude them from the general population. Those who were sent to the island were not expected to return. Others who passed away were taken through Hop Hollow Road up to a designated burial ground and when the deaths became too many to handle, bodies were lined up along the prison walls with graves dug in the prison yard. The death and misery that surrounded the Alton Prison during it's time before and during the Civil War led to numerous ghost stories. During a previous bus tour led by Taylor, they traveled down Hop Hollow road when suddenly two women began to scream in terror. They swore they saw a man waving his hands, as to get their attention, only to then disappear. Additional reports of ghostly sightings along this road have been noted over the years as well as sightings at the old prison grounds. Our bus stopped at the location of the Alton Penitentiary. A few stones are all that is left of the buildings but the stories remain. The area where numerous bodies were buried on the prison grounds is now a parking lot. There have been sightings of men in ragged clothing and no shoes seen in this area. Could they have been distraught men down on their luck? Perhaps, expect these men are known to simply disappear into the night; there one second, and gone the next. The night ended back where we started in Alton. History, hauntings, dinner, and wine were all accomplished in one night's tour. Many more stories and ghostly tales were told during the tour and is worth hearing first hand. The Ghosts of the Great River Road Tour is a perfect opportunity for a date night, girls night, or a unique weekend adventure that all those 21 and over can enjoy. You can check out www.altonhauntings.com for additional Ghosts of the Great River Road Tour dates, including two scheduled for this April, as well as other Haunted Alton events. In addition, American Hauntings will host their 21st Annual Haunted America Conference in Alton this June. The event will feature speakers and experts in the paranormal field, vendor booths, an art show, and after hours events. More information and tickets are available at www.americanspookshows.com. Copies of Haunted Alton as well as other Troy Taylor books can be found at www.whitechapelpress.com. American Hauntings also hosts tours in several other locations including: Carlinville, Chicago, Decatur, Jacksonville, & Lebanon, as well as overnight paranormal investigations across the country. You can find out more information about these events at www.prairieghosts.com.